Eating healthily doesn’t always have to be without meat or vegetarian, even if there are a lot of most delicious Russian vegan recipes that you must try. If you’re basically not a vegetarian, then you don’t have to worry, because you can still be healthy while eating meat. Well, how can it be possible? Of course it’s possible if you cook or eat delicious Russian meat-based food that will make you eat with gusto in a more healthy way. With just the right portion and intensity, you can enjoy meat while still being healthy and able to maintain your ideal weight by working out. There are a lot of most popular autumn foods in Russia, but thankfully, there are also a lot of meat-based cuisine that will satisfy you in such a classy way. They will not only help you to fulfill your craving for meat with such delicious taste, but will also let you absorb all of the nutrition and vitamins that you need from it. Most of those Russian foods are also combined with the right, balanced amount of vegetables and other ingredients. What are the most popular meat-based food from your country? Well, you’ll probably be able to answer that simply, wouldn’t you? However, what if people ask you the popular meat-based food from another country? Too bad if you didn’t know the goodness of those cuisine, right? Are you craving for something hot and warm to fill your tummy? Russia has this beef stew that will make you go crazy for it, especially during cold day aside from the most favorite food in Russia during winter season. This beef stew doesn’t only come with beef but also vegetables such as potato, carrot, celery, parsley, and of course, onion. It’s calming and delicious, with the savory taste of the beef broth. Moreover, it’s cooked traditionally on a ceramic pot in the oven, which will enchance the taste that will comfort you and make you feel like home. As for serving, just like how Russian prefers, you can put sour cream on top and enjoy it while it’s hot. If you love doing barbeque, enjoying roasted and grilled meat a lot, then this dish might be something you shouldn’t miss. Shashlik, a Russian version of kebab that people eat all around the world will fill your tummy with its deliciousness. It can also be a best Russian food for party or celebration with friends or neighbors. Traditionally, it is made in a wood fire, offering you the best taste with all of the herb that make the taste goes stronger. The meat used for Shashlik is often pork, but you can always change it as you wish, can’t you? All Asian food lovers who never try Russian cuisine, this one might be your favourite before you even taste it. If you’re a big fan of dumpling, then you’ll fancy this Russian dumpling that will taste great. Basically, it’s filled with minced beef or any meat you prefer, but it can be cooked in vegetarian way by changing the fillings with mushroom or vegetables. Sometimes, people prefer eat this with the broth, but also delicious just with a spoon of sour cream on top. If you just can’t wait till you visit Russia, then try making this at home with the fillings of your own choice. Tired of conventional meat-based food? Then why not putting it inside a yummy pastry bun? Russian make this come true by their cuisine that’s known as Pirozhi. This crispy pastry bun will let you taste the crunchiness even from the very tip. Leading you to the middle part where the heaven is, the fillings. It’s usually filled with cooked meat that taste so good along with the flaky pastry. It also has its other version from other country, which have different way of presentation. For example, in Greece, it’s usually filled with pork, with whole different shape from the one that came from Findland, Asia, and so on. If it’s filled with pork, of course it can’t be on the list halal foods in Russia that every muslim tourist must know, but you can always enjoy the one filled with other meat. If you crave for rice, then this can be the best dish for you. Plov is a classic Russian comfort food that can be also found throughout India, Uzbekistan, Middle eastern, and so much more. However, it’s basically rice cooked in special broth along with vegetables and meat of your choice. This delicious Russian meat-based food that will make you eat with gusto can be enjoyed with lamb, beef, chicken, or even pork. Since the rice’s not cooked in the usual way, instead, with herbs, spices, and meat, it taste so good. The flavor of the meat will enchance the tastiness of the well-cooked rice. This is a great choice of food that can be enjoyed with family or friends. Noodle lovers, it’s time for you to cheer and take a fork. This Russian noodle made by water, butter, salt, eggs, and flour altogether will let you taste the chewiness of the noodle. It can be used for soup or just fried noodle along with chicken or beef. If you prefer using pork or lamb, it will also be fine. The most popular version is the one with chicken meat and chicken broth as it is so comforting during cough or fever. Well, the collagen of the noodle soup will make you at ease along with the yummy noodle. If you crave for something creamy and meaty, then this can be a good dish. 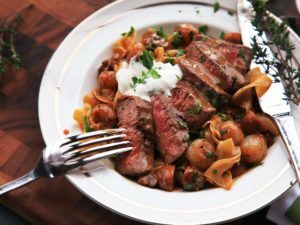 Named after Alexander G Stroganoff, this dish has pleased a lot of Russians and also people around the world who ever taste any version of it. Simply made with beef, onions, mushrooms, it’s still too good to be missed. As for the sauce, it usually uses white wine to enchance the flavor. Classic Russian, never leave sour cream on their dish. Enjoy this warm food slowly, let the meat and creamy taste stay on your tongue until the end. Craving for fried meat-based food? Grab this yummy Russian chicken meatballs that will satisfy your cravings. Made with meat patties that’s combined with onions and bread crumbs, you’ll get to take a bite of crunchiness while still able to feel the soft texture of the patties. For serving? Remember that Russian never forget sour cream. Mix with other mayonnaise of your favorite to give it more variations. What are you waiting for, then? Go and taste those delicious Russian meat-based food that will make you eat with gusto right away. Make sure you don’t only know and taste favorite foods in Russia during summer. Satisfy yourself with the comfort of Russian foods and get stuffed.